Would you like to support the Michigan Battle of the Buildings? This program is brought to you by the USGBC West Michigan Chapter. The USGBC is a committee-based, member-driven, consensus-focused non-profit (501c3) organization with the mission to transform the way buildings and communities are designed, built and operated, enabling an environmentally and socially responsible, healthy, and prosperous environment that improves the quality of life in one generation. Battle seeks partnerships to work collaboratively with like organizations. Do you have a program that can help Battle contestants reduce energy and water use? Lets talk! Please contact us. The Michigan Battle of the Buildings is built on strong community partnerships. 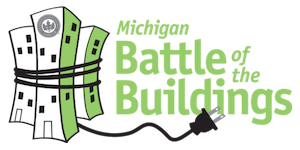 If you are interested in how your business can partner with the Michigan Battle of the Buildings program please contact us. The Michigan Energy Summit attracts more than 250 decision makers from across the state. As a sponsor of the Summit you will have access to guests and the opportunity to showcase your company as a resource. Opportunities available!